CIVIL ENGINEER: Permco Engineering & Management. Sited at the foot of Mt. 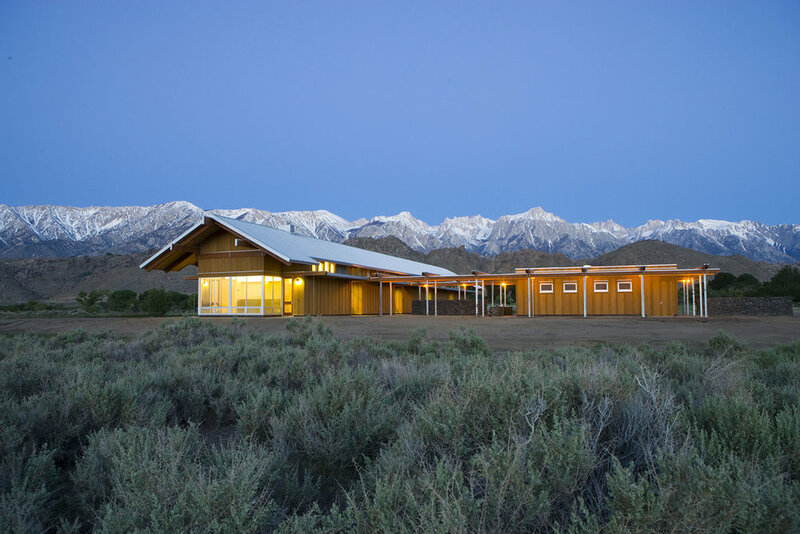 Whitney, the Visitor Center is located in a twelve-acre spectacular valley bounded by the Inyo Mountains to the east and the Eastern Sierra Nevada to the west. 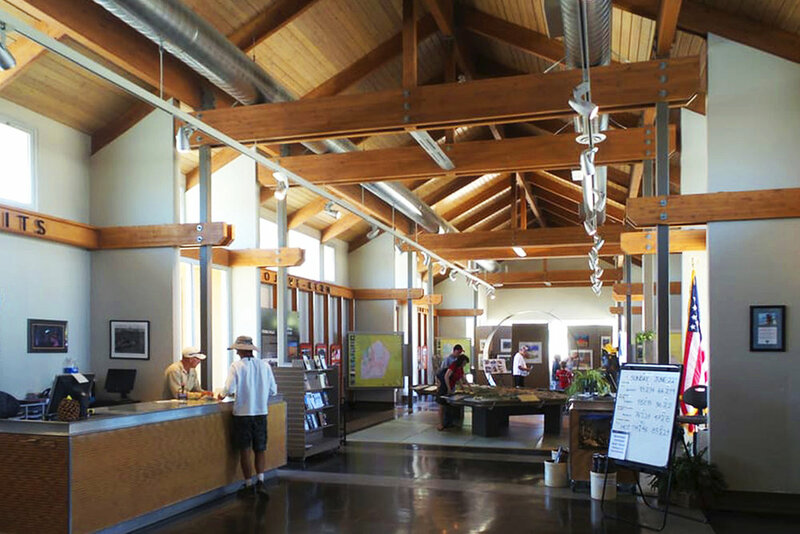 The program for this gateway to California’s high desert includes a gallery for the display of exhibits depicting the history, flora and fauna of the region, a bookstore, staff offices, permitting services for hikers and tourists, regional native plant gardens, picnic areas, and view-points. The architecture is intended to convey a bond to and immediacy with the locale's history and environment. The design expression evokes the region's spirit, while being critically informed by the political events and environmental lessons of the past. This is demonstrated through green design, and with the use of simple site elements and building forms that recall the geometries and materials of the region's agricultural and rail-road history, respectfully complementing the majesty of the environment. The Visitor Center tells the “water story” of the Owens’ River Valley: how the delicate balance of the eco-system has changed as the area has become an important source of water for the City of Los Angeles. The primary materials employed are clear stained Cedar siding, local Basalt rock (from a Westgard Pass mountain) and Zincalume. The simple geometries are proportioned, oriented and located for views of the mountains and meadows, passive energy, visibility from the highway and pedestrian approach. 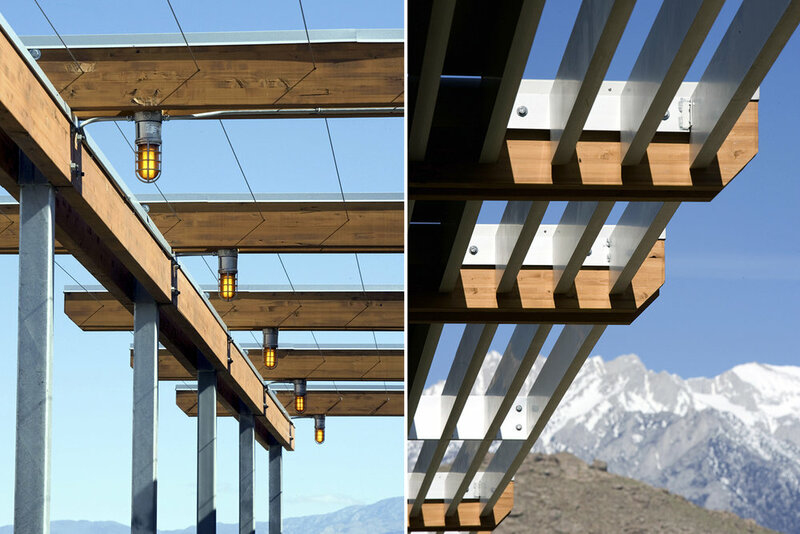 Functional elements such as sun shade devices, rain chains, lighting fixtures, and trellises, add visually enriching detail at the interior and exterior of the structure. To provide habitat and promote bio-diversity, restoration of the original natural meadow was essential. Within the meadow, an existing water course was channeled to perform aesthetic, narrative and pragmatic functions. 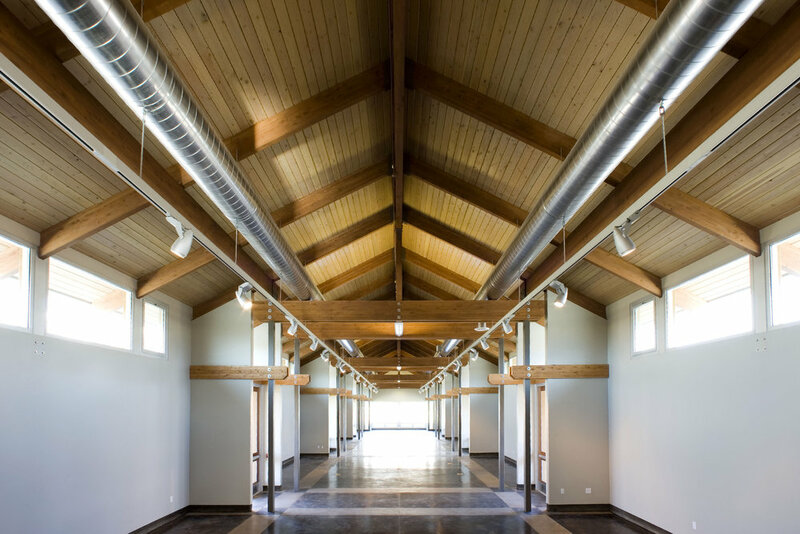 Given the extreme seasonal temperatures of the valley and acreage of the site, geo-thermal technology was ideal for drawing energy from the earth’s constant temperature. The social mission – to educate and enlighten visitors about the region’s natural and cultural history, ecology, and geography - was paramount in the development of the project. 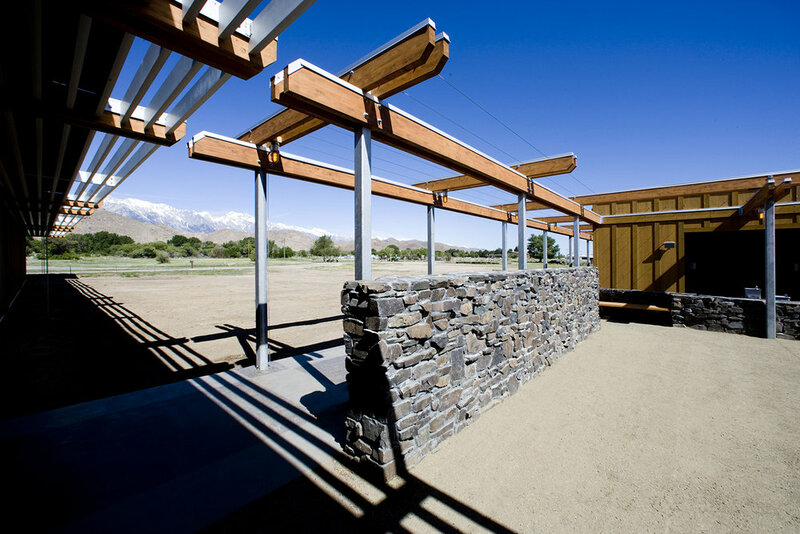 The objective was not only to provide an oasis for weary travelers along Highway 395, but to take that opportunity to inspire the public through education about the region, and particular attention to environmental issues. Ultimately, the project itself is a demonstration of “Sustainable Design” principles in the context of a damaged, yet beautiful environment in need of rehabilitation.